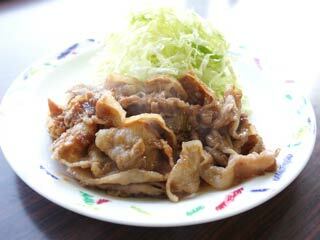 Shogayaki, pork Ginger, is one of the popular Japanese food. It is very popular for a lunch box and restaurants. It is a ginger flavored pork. Pork Ginger is very easy to cook, and taste great with lots of Ginger which make our body healthy. First, let's make a ginger flavor. Then, peel off a ginger and grate a ginger. Cut pork plate half and put them in the ginger flavor for 20 min. While we are waiting, cut cabbage thin for salad. Add oil on a pan and heat it, then cook the pork. Mix with the flavor well. Removed them on the dish.